Even as the food prices in India are rising, the local vegetable vendor keeps his stall well organised by displaying the assortment of vegetables in a very colour-co-ordinated fashion. 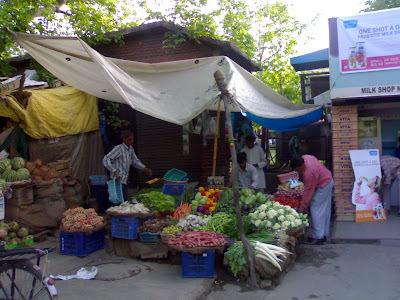 In the Hindi vernacular the vegetable vendor is called the 'Subzi-Wala' and is generally the focal point for spreading all the gossip in the locality. He sure is an important man. Keeps the health nutrition in check and rumour mills rolling. These guys are experts in sales and marketing. I really like your post today and this photograph.